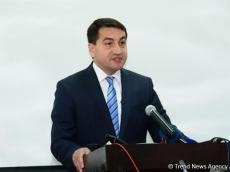 STAR refinery is an important regional energy security cooperation project, Deputy Head of the Foreign Policy Department of the Azerbaijani Presidential Administration Hikmat Hajiyev said in an interview with TRT World. “The foundation of this project was laid back in 2011 by presidents of Azerbaijan and Turkey Ilham Aliyev and Recep Tayyip Erdogan. It once again shows the confidence of Azerbaijan in Turkish economy and also demonstrates strategic partnership of the two countries,” noted Hajiyev ahead of the opening ceremony of the refinery. He pointed out that this project provides a bright future for both of these countries and is also strategically important for further development of energy cooperation between the two countries. “It is an important regional energy security cooperation project,” said Hajiyev, adding that it creates more than 30,000 jobs in Turkey and will serve to the benefits of the two countries. He noted that this project has a capacity of processing annually ten million tons of oil and it will tremendously contribute to the energy security of Turkey. It will decrease Turkey’s dependence on imports, and in the meantime, will provide additional, extra capacities for the countries to export the refined oil products to wider Mediterranean region and some other countries, he said. The STAR refinery will produce naphtha, diesel with ultra-low sulfur content, aviation fuel, petroleum coke, liquefied gas and other products. The refinery will not produce gasoline and fuel oil. The plant is planned to process oil of such grades as Azeri Light, Kerkuk and Urals. The refinery's processing capacity will amount to 10 million tons per year. Today, the share distribution in the project is as follows: 60 percent of shares are owned by the Rafineri Holding (being in 100-percent possession of SOCAR Turkey Energy), which previously bought 18.5 percent of the participation interest of Turcas Petrol in the project, and 40 percent of shares are owned by SOCAR.